The goal of this research was to evaluate and estimate the safety effectiveness of increasing retroreflectivity of STOP signs as one of the strategies in the Evaluation of Low-Cost Safety Improvements Pooled Fund Study (ELCSI-PFS), Phase I. The ELCSI-PFS provides Crash Reduction Factor (CRF) and economic analysis for the targeted safety strategies where possible. The estimate of effectiveness for increasing retroreflectivity of STOP signs was determined by conducting scientifically rigorous before-after evaluations at sites where this strategy was implemented in the United States. This safety improvement and all other targeted strategies in the ELCSI-PFS are identified as low-cost strategies in the NCHRP Report 500 guidebooks. Participating States in the ELCSI-PFS are Arizona, California, Connecticut, Florida, Georgia, Illinois, Indiana, Iowa, Kansas, Kentucky, Maryland, Massachusetts, Minnesota, Mississippi, Montana, New York, North Carolina, North Dakota, Oklahoma, Pennsylvania, South Carolina, South Dakota, Tennessee, Texas, Utah, and Virginia. The FHWA (Office of Safety Research and Development) managed this study. The project team members were Kim Eccles, Nancy Lefler, Dr. Hugh McGee, Dr. Frank Gross, Dr. Forrest Council, Ram Jagannathan, Dr. Bhagwant Persaud, Craig Lyon, Dr. Raghavan Srinivasan, and Daniel Carter. The FHWA Office of Safety Research and Development Contract Task Order Manager was Roya Amjadi. The Federal Highway Administration (FHWA) organized a Pooled Fund Study of 26 States to evaluate low-cost safety strategies as part of its strategic highway safety effort. One of the strategies chosen to be evaluated for this study was STOP signs with increased retroreflectivity. This strategy is intended to reduce the frequency of crashes related to driver unawareness of stop control at unsignalized intersections. Geometric, traffic, and crash data were obtained at unsignalized intersections for 231 sites in Connecticut and 108 sites in South Carolina. In each case, the strategy was implemented as a blanket application of STOP signs with increased retroreflectivity. Empirical Bayes (EB) methods were incorporated in a before-after analysis to determine the safety effectiveness of increasing the sign retroreflectivity. There was a statistically significant reduction in rear-end crashes in South Carolina. Based on the results of the disaggregate analysis, reductions in crashes were found at three-legged intersections and at intersections with low approach volumes. The analysis also indicated a slight reduction in nighttime- and injury-related crashes in Connecticut and South Carolina, but the results were not statistically significant. It was determined that a sample size much larger than that available would be needed to detect a significant effect in these types of crashes. Given the very low cost of installing STOP signs with increased retroreflectivity, even with conservative assumptions, only a very modest reduction in crashes is needed to justify their use. Therefore, this strategy has the potential to reduce crashes cost-effectively, particularly at lower volume intersections. Figure 1. Relative Visual Comparison of Sheeting Types. The Federal Highway Administration (FHWA) organized a Pooled Fund Study of 26 States to evaluate low-cost safety strategies as part of its strategic highway safety effort. The purpose of the FHWA Low-Cost Safety Improvements Pooled Fund Study is to evaluate the safety effectiveness of several of the low-cost strategies through scientifically rigorous crash-based studies. One of the strategies chosen to be evaluated for this study was the implementation of STOP signs with higher retroreflectivity. This strategy is intended to reduce the frequency of crashes related to driver unawareness of stop control at unsignalized intersections. The safety effectiveness of this strategy had not previously been thoroughly documented and this study is an attempt to provide an evaluation through scientifically rigorous procedures. Geometric, traffic, and crash data were obtained at unsignalized intersections for 231 sites in Connecticut and 108 sites in South Carolina. In each case, the strategy was implemented as a blanket application of STOP signs with increased retroreflectivity. Empirical Bayes (EB) methods were incorporated in a before-after analysis to determine the safety effectiveness of increasing the sign retroreflectivity. For rear-end crashes, there was a statistically significant reduction in crashes in South Carolina. Based on the results of the disaggregate analysis, reductions in crashes were found at three-legged intersections and at intersections with low approach volumes. Installations at three-legged intersections (indiscriminate of urban/rural factor) and three-legged urban intersections in South Carolina were found to have a statistically significant reduction in crashes. In Connecticut, a statistically significant reduction in crashes was found for three-legged rural intersections. The disaggregate analysis also showed that the strategy is more effective at lower volumes for the minor approach. A statistically significant reduction in crashes was found at intersections with approaching volumes of less than 1,200 annual average daily traffic (AADT) in South Carolina and less than 1,000 AADT in Connecticut. The analysis indicated a slight reduction in nighttime- and injury-related crashes in Connecticut and South Carolina, but the results were not statistically significant. It was determined that a sample size much larger than that available would be needed to detect a significant effect in these types of crashes. Given the very low cost of this strategy, even with conservative assumptions, only a very modest reduction in crashes is needed to justify its use. Therefore, this strategy has the potential to reduce crashes cost effectively, particularly at lower volume intersections. Intersections account for a small portion of the total highway system, yet in 2005, approximately 2.5 million intersection-related crashes occurred, representing 41 percent of all reported crashes. Intersection-related crashes account for more than 50 percent of total crashes in urban areas and over 30 percent of total crashes in rural areas. In addition, 8,655 fatal crashes (22 percent of the total 39,189 fatal crashes) occurred at or within an intersection environment in 2005. (1) The high frequency of crashes is not surprising, however, due to the fact that intersections present more points of conflict than non-intersections. Driver compliance with intersection traffic control devices is vital to intersection safety. 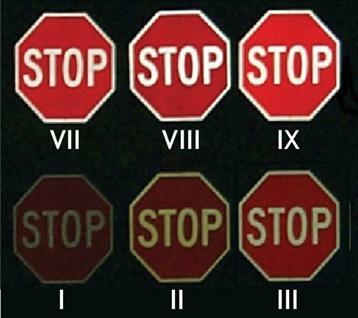 At stop-controlled intersections, drivers on the stop-controlled approach must identify and observe the STOP sign. Therefore, the STOP sign must be visible and conspicuous. This is particularly important during nighttime or other reduced visibility conditions such as rainy weather. One method to increase both the visibility and conspicuity of STOP signs is to use higher retroreflectivity sheeting. Figure 1. Image. Relative Visual Comparison of Sheeting Types. The strategy to change to STOP signs with higher retroreflectivity was implemented in Connecticut from 1998 to 2001 and in South Carolina from 1997 to 2004 in an effort to reduce crashes at unsignalized intersections. The National Cooperative Highway Research Program (NCHRP) published a series of implementation guides to advance the implementation of countermeasures targeted to reduce crashes and injuries. Each guide addresses one of the 22 emphasis areas and includes an introduction to the problem, a list of objectives for improving safety in that emphasis area, and strategies for each objective. Each strategy is designated as proven, tried, or experimental. Many of the strategies discussed in these guides have not been rigorously evaluated; about 80 percent of the strategies are considered tried or experimental. The FHWA organized a Pooled Fund Study of 26 States to evaluate low-cost safety strategies as part of this strategic highway safety effort. The purpose of the Pooled Fund Study is to evaluate the safety effectiveness of several tried and experimental low-cost safety strategies through scientifically rigorous crash-based or simulation-based studies. Based on inputs from the Pooled Fund Study Technical Advisory Committee and the availability of data, installing higher retroreflective STOP signs was selected as a strategy that should be evaluated as part of this effort. The literature review did not uncover any studies that specifically evaluated the safety effects, in terms of crash frequency and severity measures, of increasing retroreflectivity levels of STOP signs. There has been research, however, that shows increased driver visibility distance provided by increased retroreflectivity levels. This research includes a study by Carlson and Hawkins, which investigated the legibility effects of increasing the retroreflectivity of freeway guide signs. (5) In this study, ASTM Type III and Type IX retroreflective sheeting were analyzed. A total of 60 subjects, both young and old, participated in this nighttime study. The measure of effectiveness used in this study was legibility distance. The statistical test used was a mixed-factor repeated-measures analysis of variance (ANOVA). The ANOVA test indicated that sheeting type was statistically significant (F1,116 = 34.69, p-value < 0.0001). The improvement associated with increasing the retroreflectivity was nearly a 10-percent (16.2-m (53.0-ft)) increase in visibility distance. The link between visibility and crashes has not been established; therefore, no safety inference can be made from this finding. Injury crashes (includes K, A, and B on KABCO scale). Do effects vary by traffic volumes? Do effects vary by approach speeds? Do effects vary by number of lanes? The need to properly account for traffic volumes changes. The need to pool data from more than one jurisdiction to improve reliability of the results and facilitate broader applicability of the products of the research. For this analysis, it was assumed at the time that the study was designed that a conventional before-after study with comparison group design would be used, since available sample size estimation methods are based on this assumption. To facilitate the analysis, it was also assumed that the number of comparison sites is equal to the number of strategy sites. The sample size estimates provided would be conservative in that state-of-the-art EB before-after methodology actually proposed for the evaluations would require fewer sites. Sample sizes were estimated for various assumptions of likely safety effect and crash frequencies before the strategy was installed. Table 1 provides the crash frequency assumptions used. Rate A is based on a Minnesota study. (8) Rate B is based on an Ohio Study. (9) Rate C is based on Minnesota data from FHWA-RD-03-0037. (10) Right-angle and rear-end proportions were adopted from SafetyAnalyst development data. (11) The literature review provided no sound basis for an assumption on the expected safety effect. Thus, the analysis was based on logical values for this parameter. Table 2 provides estimates of the required number of before period intersection-years in the sample for both the 90-percent and 95-percent confidence levels. The calculations assume equal number of intersection-years for strategy and comparison sites and equal length of before and after periods. Intersection-years are the number of intersections where the strategy was applied multiplied by the number of years the strategy was in place at each intersection. For example, if a strategy was applied at nine intersections and has been in place for three years at all 9 intersections, this is 27 intersection-years. A minimum sample size of 1,076 intersection-years and a desirable sample size of 2,036 intersection-years per period were calculated as shown in bold in table 2. It was expected that these sample sizes could be reduced if the assumption for crashes per intersection-year before strategy implementation turns out to be conservatively low for strategy data, or if more after period years than assumed are available. The desirable sample assumes that the reduction in crashes could be as low as a 10-percent reduction in all crashes and that this is the smallest benefit that one would be interested in detecting with 90-percent confidence. The logic behind this approach is that safety managers may not wish to implement a measure that reduces crashes by less than 10 percent, and the required sample size to detect a reduction smaller than 10 percent would likely be prohibitively large. The minimum sample indicates the level for which a study seems worthwhile (i.e., it is feasible to detect with 90-percent confidence the largest effect that may reasonably be expected based on what is known currently about the strategy). In this case, a 20-percent reduction in right-angle crashes was assumed as this upper limit on safety effectiveness. These sample sizes could be reduced if the assumption for crashes per intersection-year before strategy implementation turned out to be conservatively low for strategy data or if there are more after period years of data available than assumed. Table 2. Minimum Required Before Period Intersection-Years for Treated Sites. Note: Bold denotes the calculated minimum and desirable sample size for intersection-years per period. is the expected number of crashes that would have occurred in the after period without the strategy. is the number of reported crashes in the after period. In estimating , the effects of regression-to-the-mean and changes in traffic volume were explicitly accounted for using safety performance functions (SPFs) relating crashes of different types to traffic flow and other relevant factors for each jurisdiction based on untreated sites. Annual SPF multipliers were calibrated to account for the temporal effects on safety of variation in weather, demography, crash reporting, and so on. A factor is then applied to m to account for the length of the after period and differences in traffic volumes between the before and after periods. This factor is the sum of the annual SPF predictions for the after period divided by P, the sum of these predictions for the before period. The result, after applying this factor, is an estimate of . The procedure also produces an estimate of the variance of . The estimate of is then summed over all sites in a strategy group of interest (to obtain sum) and compared with the count of crashes during the after period in that group ( sum). The variance of λ is also summed over all sites in the strategy group. The percent change in crashes is calculated as 100(1- ); thus a value of = 0.7 with a standard deviation of 0.12 indicates a 30-percent reduction in crashes with a standard deviation of 12 percent. A survey was conducted to collect data for several low-cost strategies. Two States, Connecticut and South Carolina, responded that they had installed a large number of STOP signs with increased retroreflectivity as a blanketed effort across the State to improve safety. In addition to the locations and dates of the STOP signs, additional data including roadway geometry, traffic, and crash data were collected in order to conduct the evaluation. This section provides a summary of the data assembled for the analysis. The Connecticut Department of Transportation (ConnDOT) replaced over 7,000 STOP signs (R1-1) on State highways and town roads approaching State highways from December 1998 to May 2001. The signs were replaced as part of a comprehensive replacement program. The overall motivation for the effort was traffic safety. However, individual locations were not selected based on crash experience. Instead, the replacement was a blanketed effort at all stop-controlled intersections. ConnDOT provided installation data, roadway, and traffic data for use in this study. The data collected were entered into a database, designed specifically for use in this evaluation, and matched to crash data supplied by the University of Connecticut (UCONN). Details on the data are provided in the following sections. The installation data provided by ConnDOT contained the town name, route number, intersecting road name, size of the sign, and the date the sign was replaced. Of the 7,000 sign locations provided by ConnDOT, 231 intersections were included in the evaluation. The primary motivation for selecting these 231 intersections was the availability of traffic volume data. This is discussed in the section on traffic data. Of the intersections used in the evaluations, 762-mm (30-inch) STOP signs were installed at 218 intersections, 1,219.2-mm (48-inch) STOP signs were installed at 11 intersections, and a combination of 762-mm (30-inch) and 1,219.2-mm (48-inch) STOP signs were installed at the remaining 2 intersections. ConnDOT provided access to a 2004 electronic photo log of the roadway system. Roadway data were collected for each intersection from the photo log. This included the intersection log mile, number of intersection approaches, number of roadway lanes per approach, presence of a shoulder on each approach, presence of a median on each approach, presence of other warning measures (e.g., STOP AHEAD warning signs), and intersection illumination. There was a concern that some of the STOP signs used in the evaluation had received subsequent strategies such as a signal or a flashing beacon. Based on the photo logs, 18 intersections were identified that had been signalized or a flashing beacon had been installed since the STOP signs were replaced. A list of energized signals, provided by ConnDOT, helped to identify other intersections that had received a signal, and the signalization date. ConnDOT also provided the dates of the flashing beacons installations. The primary reason many intersections were excluded from the evaluation was the lack of traffic volume data. In order to be included in the evaluation, traffic volume on the major road was needed both before and after the sign was replaced. In addition, there had to be a traffic count on the minor roadway in at least the before or after period, although both were preferred. Volume data are available from three sources in Connecticut: average daily traffic (ADT) maps, electronic count data in a spreadsheet format, and special counts. The ADT maps are available in both hard copy and electronic (.pdf) formats from 1999 to 2004. Traffic counts are conducted every three years to develop these maps. The count locations vary from year to year; not all locations were counted on each map. The electronic count data contained the same information as the ADT maps but for a longer period. Electronic count data are available from 1995 to 2006. For the purposes of extrapolating counts from nearby intersections, spatial count maps (i.e., the ADT maps) are preferable to tabular count data. The third source of volume data are special counts. ConnDOT provided paper copies of special counts. These are volume counts that are requested for a variety of reasons including signalization studies, citizen complaints, and traffic operations analysis. The stop-controlled roadway was considered the minor roadway for this study. In most cases, this was also the lower volume roadway. There were a few three-legged intersections where the stop-controlled approach had a higher ADT than the nonstop-controlled approach. Therefore, there were a few intersections in the database where the minor roadway had a higher ADT than the major roadway. The Connecticut Transportation Institute at the UCONN provided crash data from 1995 to 2004 for this study. These data were originally provided to UCONN by the ConnDOT. UCONN formatted the raw data into a more user-friendly version. These data included all crashes on State-maintained roadways and crashes on non-State-maintained roadways that occurred within 0.02 km (0.01 mi) of an intersection with a State-maintained roadway. Therefore, all intersections in this study included at least one State-maintained roadway. During the evaluation, it was discovered that there were log-mile changes throughout the study period. That is, the same intersection could have two different log miles in two different years. This was due to changes in the Connecticut roadway system. ConnDOT supplied a file of where log mile changes have occurred. These were used to resolve the log mile changes. District 1 of the South Carolina Department of Transportation (SCDOT) conducted a comprehensive replacement of over 6,000 STOP signs from 1997 to 2005. District 1 is located in central South Carolina and is comprised of Aiken, Kershaw, Lee, Lexington, Richland, and Sumter Counties. Data from Kershaw and Lexington counties were used for this study. The existing signs were made of Type I Engineer Grade reflective sheeting. The exact age and condition of the signs prior to replacement was unknown. They were replaced with signs that had Type III high-intensity reflective sheeting. The signs were replaced as part of a comprehensive replacement program. SCDOT provided installation data, roadway, traffic, and crash data for use in this study. The data collected were entered into a database, designed specifically for use in this evaluation, and matched to crash data. Details on the data are provided in the following sections. SCDOT provided a database of sign installations. For each sign, the database included the county, route, milepoint, direction, installation date, and sheeting type. Out of the more than 6,000 signs, 108 intersections were used in the evaluation. As with the Connecticut data, this was largely due to the availability of the traffic data. Of the 108 intersections, 93 had 762-mm (30-inch) STOP signs installed, and 15 had 1,219.2-mm (48-inch) STOP signs installed. SCDOT provided a copy of the roadway and traffic data that were collected for the Highway Performance Monitoring System (HPMS). The HPMS is a national highway information system that includes data on the extent, condition, performance, use, and operating characteristics of the Nation's highways. This database provided data on the land use (i.e., urban or rural), number of lanes, lane width, presence of a shoulder, shoulder width, presence of a median, and median type for each intersection approach. The speed limit was also available for 35 of the intersections. The majority of the traffic volumes used for this study were extracted from the HPMS files. These values came from a segment of roadway ranging from 0.16 to 8.05 km (0.1 to 5.0 mi) or more in length. The range was less in urban areas and greater in rural areas. Therefore, in rural areas, the volume count used to describe the volume entering the intersection may be collected from a point up to 8.05 km (5 mi) from the intersection. There were no records of where in the segment the count was actually collected. For those locations where AADTs were not available through the HPMS, the AADT numbers were calculated from turning movement counts. Factors supplied by SCDOT were used to calculate the AADTs from the raw turning movement count data. SCDOT supplied crash data in two databases. One database contained crashes occurring from 1994 to 2000. The second database contained crashes occurring from 2001 to 2005. The second database system was necessary because the crash data report and some associated variables were modified in 2001. In addition, prior to 1997, there was no threshold on reporting property damage only crashes. Starting in 1997, only crashes involving an injury or property damage greater than $1,000 were reported in the system. Based on guidance from the SCDOT, the crash milepost was not used to locate crashes. Instead, the variable "base-offset distance" was used to identify crashes occurring at intersections. The analysis included a total of 3,323.8 intersection-years of data (2,038.6 intersection-years from CT and 1,285.2 intersection-years from SC). This sample was greater than the 1,076 intersection-years estimated in the study design required to detect a 20-percent reduction in right-angle crashes and the 2,036 intersection-years required to detect a 10-percent reduction in all crashes. Table 3 provides crash definitions used in the two States. This information is crucial in applying the safety effect estimates in other jurisdictions. Table 3. Definitions of Crash Types. Table 4 and table 5 provide summary information for the data collected. This information should not be used to make simple before-after comparisons of crashes per site-year since such an analysis would not account for factors other than the strategy that may cause safety to change between the two periods. Such comparisons are properly done with the EB analysis as presented in subsequent sections. Table 4. Data Summary for South Carolina Sites (n = 108). Table 5. Data Summary for Connecticut Sites (n = 231). This section presents the SPFs that were developed for use in the EB methodology. Generalized linear modeling was used to estimate model coefficients using the software package SAS® and assuming a negative binomial error distribution, which is consistent with the state of research in developing these models. Combine the before and after period data to develop SPFs. Recalibrate each SPF separately for the before and after periods to develop yearly multipliers. Since the installations were over a multiyear period, it was possible to represent yearly trends in crash counts in an unbiased way that would not be possible if all installations occurred in the same year. maj is major road entering AADT. min is minor road entering AADT. are parameters estimated from data in the SPF calibration process. AADT is the total entering AADT. is a parameter estimated from data in the SPF calibration process. Using additional variables did not significantly improve the models. In specifying a negative binomial error structure, the "dispersion" parameter, k, which relates the mean and variance of the SPF estimate and is used in equations 3 and 4 of the EB procedure, is iteratively estimated from the model and the data. The value of k is such that the smaller its value, the better a model is for a given set of data. The value of is obtained as the ,where ln( ) is the model output. 5-percent level (or, alternatively, that the 95-percent confidence interval does not include a value of 0). Right angle (all severities combined). Rear end (all severities combined). Day (all severities and types combined). Night (all severities and types combined). Based on the data, two sets of results were calculated and are presented in the following sections. One set contains aggregate results for each jurisdiction and for the two combined; the other set is based on a disaggregate analysis that attempted to discern factors that may be most favorable to increasing STOP sign retroreflectivity. The aggregate results are shown in tables 6 through 8. Results significant at the 95-percent confidence level are bolded. Note that a negative sign indicates an increase in crashes. The results indicate that there may be a slight effect in South Carolina, but this effect is too small to detect with statistical significance, as evidenced by the relatively large standard errors (i.e., substantially greater than one-half of the estimated effect). The exception is for rear-end crashes, for which the reduction in crashes is significant at the 95-percent confidence level as shown in table 6. The aggregate effects are negligible and statistically insignificant for Connecticut, and for the two jurisdictions combined. There are no detectable effects for nighttime crashes, the primary targets of this measure, which is likely a result of the reality that there are relatively few of these crashes at the strategy sites. These inconclusive results and the fact that they are based on non-selective implementations emphasize the need for a disaggregate analysis to see if significant effects can be detected for specific conditions. This analysis is presented in the next section. Table 6. Results for 108 South Carolina Strategy Sites. Notes: Bold denotes results significant at the 95% confidence level. The negative sign indicates an increase in crashes. Table 7. Results for 231 Connecticut Strategy Sites. Note: The negative sign indicates an increase in crashes. Table 8. Combined Results for 339 South Carolina and Connecticut Strategy Sites. Table 9 presents the results of the disaggregate analysis. Nighttime crashes are the primary targets of this measure and should be the basis for this analysis; however, there are too few of these crashes to facilitate a disaggregate analysis. The results of the disaggregate analysis are based on all crashes combined. Significant results at the 95-percent confidence level are shown in bold. The three factors that provided indications of an association with crash effects are environment (urban versus rural), number of approach legs, and minor road entering AADT. Table 9. Results of the Disaggregate Analysis. For the urban versus rural factor, there are opposing indications from the two States, with the more favorable effects for rural installations in Connecticut and urban installations in South Carolina. For number of approaches (i.e., legs), a more consistent pattern emerges. For both States, in particular for the favored environment, installations at three-legged intersections appear to be more effective than at four-legged intersections. For minor entering AADT, there is a consistent pattern that this strategy is more effective at lower volumes. The boundaries of 1,200 AADT in South Carolina and 1,000 in Connecticut were chosen to provide the most discrimination between upper and lower AADT levels in order to indicate the effect of this factor. Therefore, these numbers should not be used in decisions on whether or not to install a sign. The analysis does suggest, however, that lower minor road locations should be given higher priority if there is a need to prioritize locations (as should three-legged intersections). Speculation on reasons for the differential effects found is undertaken in a discussion section later in the report. However, it should be pointed out that further investigation was undertaken to ensure that the effects found were not due to biases in the analysis. This further investigation involved an examination of the results of a naïve before-after study that simply compared crash frequencies pre- and post-strategy and did not use safety performance functions. The naïve before-after study yielded similar conclusions to the EB study regarding the influence of the three factors, but different magnitudes for the crash effects for the various groupings in table 9. The project team also investigated whether the findings regarding the differential effects for one factor may have been confounded by co-linearity of this factor with another for which similar effects were found. For example, this investigation revealed that the conclusion regarding minor road AADT was equally relevant for three-legged and four-legged intersections and for urban and rural intersections. As shown in table 9, the finding regarding three-legged versus four-legged intersections is equally valid for urban and rural environments. Data were available for an analysis of other possible factors that might influence crash effects. However, no such effects could be ascertained. The other factors examined were sign size (762 mm (30 inches) versus 1,219.2 mm (48 inches)), the presence of lighting (for Connecticut), the presence of other measures such as STOP AHEAD signs, the major road entering volume, and the expected crash frequency prior to strategy. For sign size, there were very few that were of the 1,219.2-mm (48-inch) variety and so, statistically, it was difficult to detect different crash effects for the two sign sizes, even if such differences exist. The purpose of this analysis was to determine the economic feasibility of applying this strategy. The life-cycle costs of the strategy were estimated and expressed as an annual cost. The crash benefits required to offset these costs were estimated using the most recent FHWA unit crash cost data for unsignalized intersections. The results of the aggregate and disaggregate analysis of crash effects were used to make a judgment on the circumstances that would be favorable to ensuring economic feasibility (i.e., circumstances that may yield a benefit cost ratio of at least 2:1). Type I sheeting is $0.75 per square foot. Type II sheeting is $1.25 per square foot. Types VII, VIII, and IX are $3.50 per square foot. These would reflect the costs if a jurisdiction used higher retroreflective materials as part of its routine maintenance program, as opposed to replacing all of the existing signs across a jurisdiction at one time regardless of the condition of the existing signs, as was done in Connecticut and South Carolina. Based on the Office of Management and Budget suggested discount rate of 7 percent, and on the expected service life (8 years), the initial costs per intersection were converted to annual costs using the standard economics formula for a capital recovery factor. The more conservative $200 initial cost translates into an annual cost of around $33 over the 8-year cycle, requiring an annual crash saving of more than $66 per intersection for a benefit cost ratio of at least 2:1. The most recent FHWA mean comprehensive costs per crash for unsignalized intersections are $13,238 for rear-end and $61,114 for right-angle crashes. (6) Comprehensive crash costs represent the present value, computed at a discount rate, of all costs over the victim's expected life span that result from a crash. The major categories of costs used in the calculation of comprehensive crash costs include medical-related costs, emergency services, property damage, lost productivity, and monetized quality-adjusted life years. (6) By applying the more conservative figure, $13,238, a $66 saving would require a reduction of approximately 0.005 crashes per intersection per year. This is a reduction of approximately 0.5 percent for rural Connecticut intersections, which have an annual crash frequency of 1.11, the lowest of the four State/environment groups. This reflects the more conservative costs of replacing all existing signs across a jurisdiction at one time with signs with retroreflective material regardless of condition of the existing signs. Even with the conservative assumptions made, just a very modest reduction in crashes is required to justify this strategy economically. The evidence suggests that this reduction is easily achievable, in particular, under the circumstances identified from the disaggregate analysis. The objective of this study was to evaluate the safety effectiveness as measured by crash frequency of higher retroreflective sheeting on STOP signs at unsignalized intersections. The study was designed to detect a 10-percent reduction in all crashes with 90-percent confidence. The study also examined the effects of higher retroreflectivity on specific crash types. While it is desirable to evaluate the effectiveness of this strategy on related crashes (i.e., nighttime, low-visibility), there was not a sufficient number of related crashes to determine an effect with confidence. The aggregate analysis indicates that higher retroreflective STOP signs may affect the likelihood of crashes at unsignalized intersections, but the effect is not detectable with the study design and available sample size. The exception is for rear-end crashes in South Carolina, where there was a significant reduction. The disaggregate analysis provided further insight into the circumstances where crash reductions were identified. Installations at three-legged intersections (indiscriminate or urban/rural factor) and three-legged urban intersections in South Carolina were found to have a statistically significant reduction in crashes. In Connecticut, a statistically significant reduction in crashes was found for three-legged rural intersections. The disaggregate analysis also showed that the strategy is more effective at lower volumes for motorists approaching the intersection along the minor road. Statistically significant reduction in crashes were found at intersections with approaching volumes of less than 1,200 in South Carolina and less than 1,000 in Connecticut. This volume related finding is expected. At higher volume intersections, there are more visual cues for the approaching minor road motorist that the intersection is stop-controlled. Most notably, other traffic stopped in front of the driver on the approach is a visual cue. For the urban versus rural factor, there are opposing indications from the two States, with the more favorable effects for rural installations in Connecticut and urban installations in South Carolina. There was no explanation available for these inconsistent results between the two States. There are no detectable effects for nighttime crashes. As discussed previously, this might be because there are relatively few of these crashes at the strategy sites. It is also likely that this is because these are blanket installations and the significant benefits at relatively few nighttime crash problem locations become diluted by the negligible effects at other locations. To establish the benefits for nighttime crashes with statistical significance would require a database with a substantial number of sites at which this strategy was implemented because of a high frequency of nighttime crashes perceived to be "correctable" by this strategy. The sample size required for such a special database would be of a similar order of magnitude to that required for the database for the blanketed installations. It should be noted, however, that the study results do not support the degradation of signs below any desired retroreflectivity requirements. The results are based on a blanket improvement with no knowledge of the previous sign conditions. This being the case, it is difficult to determine the safety effectiveness of more highly retroreflective sheeting on STOP signs for specific conditions. There was not a large enough sample size to detect any significant effects. The sample size required to detect a significant effect would be outside the scope of this project. As indicated in the FHWA Supplemental Notice of Proposed Amendments, improving sign retroreflectivity will be a benefit to all drivers, including older drivers. (12) All drivers need legible signs in order to make important decisions at key locations, such as intersections and exit ramps on high speed facilities. This is particularly true for regulatory and warning signs. A minimal reduction in crashes can be expected with the installation of higher retroreflective STOP signs. However, given the very low cost of this strategy, even with conservative assumptions, only a very modest reduction in crashes is needed to justify their use. Therefore, this strategy has the potential to reduce crashes cost effectively, particularly at lower volume intersections. Table 14. Day—All Severities and Types. Table 15. Night—All Severities and Types. A model for rural night, all severities and types, crashes could not be estimated. A proportion of 26.7 percent of total crashes was used; that is, a factor of 0.267 to the rural total crash SPF was applied. Table 20. Day—All Severities and Types. Table 21. Night—All Severities and Types. A model for rural night, all severities and types, crashes could not be estimated. A proportion of 24.0 percent of total crashes was used; that is, a factor of 0.267 to the rural total crash SPF was applied. This report was prepared by Vanasse Hangen Brustlin, Inc. (VHB) for the FHWA, Office of Safety under Contract DTFH61-05-D-00024. The current FHWA COTM for this project is Roya Amjadi. Kerry Perrillo Childress served as FHWA COTM from September 2005 until December 2006. Kimberly Eccles, P.E., of VHB was the study principal investigator. Dr. Bhagwant Persaud and Craig Lyon, subcontractors to VHB, conducted the analysis of the strategy and are the primary authors of the report. Nancy X. Lefler of VHB led the data collection for the study and is a supporting author. Other significant contributions to the study were made by Dr. Hugh McGee, Dr. Forrest Council, Michelle Scism, Nitesh Gupta, and Vicki Glenn, all of VHB. The Connecticut Department of Transportation, particularly Mr. John F. Carey, Mr. Al Iallonardo, Mr. Brad Overturf, Mr. Sebastian Puglisi, Ms. Kerry Ross, Mr. Gene Interlandi, and Ms. Julie Annino. Connecticut Transportation Institute at the University of Connecticut (UCONN), particularly Mr. Thomas Jonsson. The South Carolina Department of Transportation, particularly Ms. Terecia Wilson, Ms. Amelia Glisson, and Mr. Bryan Jones. Traffic Safety Facts. DOT HS 810 631, National Center for Statistics and Analysis of the National Highway Traffic Safety Administration, Washington, DC, 2005. Neuman, T.R., R. Pfefer, K. L. Slack, K. K. Hardy, D. W. Harwood, I.B. Potts, D.J. Torbic, E.R.K. Rabbini. Guidance for Implementation of the AASHTO Strategic Highway Safety Plan: A Guide for Addressing Unsignalized Intersection Collisions. NCHRP Report 500, Volume 5, Transportation Research Board, Washington DC, 2003. McGee, H. W. Chapter 7: Sign Materials in Traffic Signing Handbook. IR-092, Institute of Transportation Engineers, Washington, DC, 1997. ASTM International Standard Specification for Retroreflective Sheeting for Traffic Control. ASTM D4956-05, ASTM International, West Conshohocken, PA, 2007. Carlson, P.J. and Gene Hawkins. Legibility of Overhead Guide Signs with Encapsulated Versus Microprismatic Retroreflective Sheeting. No. 1844, Transportation Research Record, Washington, DC, 2003. Council, Forrest , E. Zaloshnja, T. Miller, B. Persaud. Crash Cost Estimates by Maximum Police-Reported Injury Severity Within Selected Crash Geometries. FHWA-HRT-05-051, Federal Highway Administration, McLean, VA, 2005. Hauer, E. Observational Before-After Studies in Road Safety: Estimating the Effect of Highway and Traffic Engineering Measures on Road Safety. Pergamon Press, Elseviser Science Ltd., Oxford, U.K., 1997. Stackhouse, S; Cassidy, P. Warning Flashers At Rural Intersections. Report MN/RC-1998/01; Final Report, Minnesota DOT, Minneapolis, MN, 1996. Pant, P; Park, Y; Neti, S; Hossain, A. Comparative Study of Rural Stop-Controlled and Beacon-Controlled Intersections. No. 1692, Transportation Research Record, Washington, DC, 1999. Washington, S., B. Persaud, C. Lyon, and J. Oh. Validation of Crash Models for Intersections. FHWA-RD-03-037, Federal Highway Administration, Washington, DC, 2005. Federal Highway Administration. "SafetyAnalyst" McLean, VA. Accessed online: November 2006. (http://www.safetyanalyst.org/). Supplemental Notice of Proposed Amendments. FHWA Docket No. FHWA-2003-15149, Federal Highway Administration, Washington, DC, 2006.